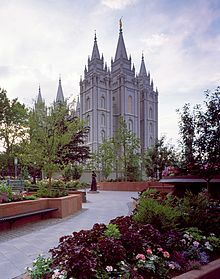 ^ Temple Square. National Historic Landmark summary listing. National Park Service. [2008-07-12]. （原始內容存檔於2007-10-18）. ^ Hinckley, Gordon B. The Salt Lake Temple. Ensign: 2. 1993-03. ^ Graham, Jim. 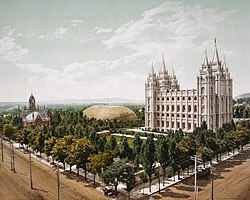 Temple Square still top tourist attraction in Utah. Daily Herald. 2006-05-21 [2006-12-14]. ^ De Groote, Michael. Decades of downtown S.L. music and lights. Deseret News. 2010-12-12. ^ Law, Kristina. Sister Missionaries. 2006 [2006-12-14]. （原始內容存檔於2007-04-29）. ^ Assembly Hall. 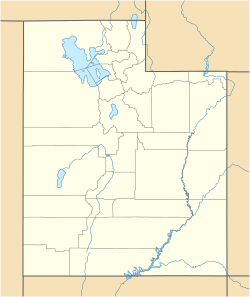 lds.org. [2016-07-07]. ^ Conference Center. lds.org. [2016-07-08]. ^ AAG International Research. AAG International Research. AAG. [2009-10-31]. （原始內容存檔於2009-12-12）.